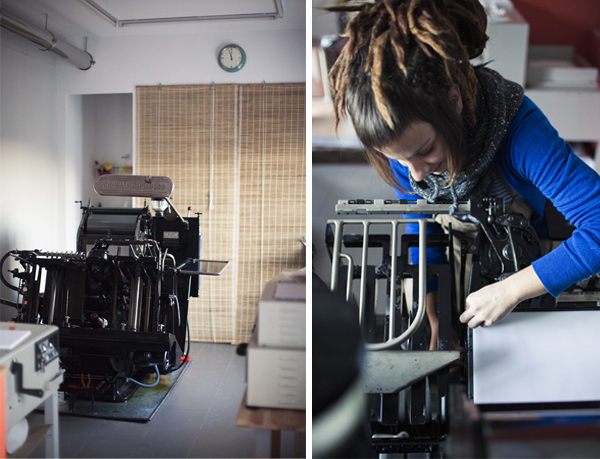 In the sunny warmth of Barcelona, Spain holds a letterpress shop with a cheerful flavor and festive personality. Mònica and Germán, of La Trasteria (“Trastero” is Spanish for “lumber rooms” as the original space was intended for cut timber) are the power duo of printer & designer for the company, and you can find their work gracing worldwide art galleries and shows. 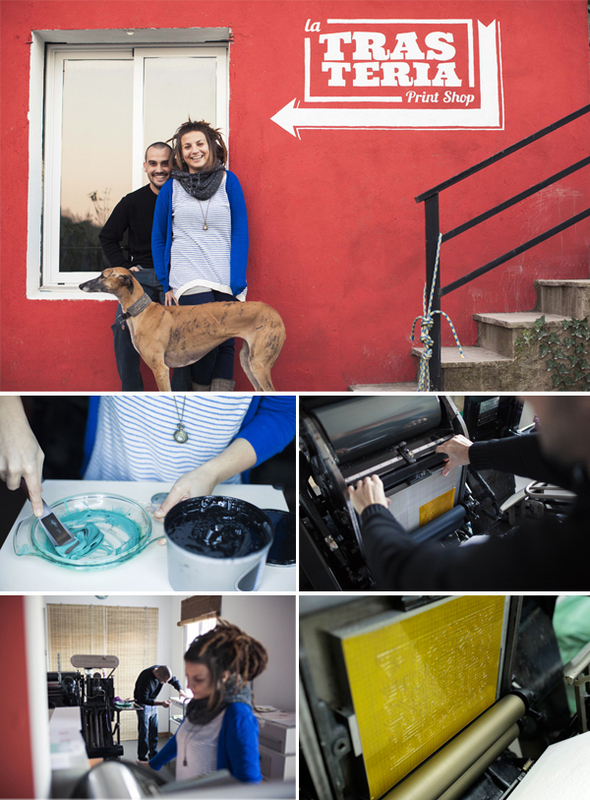 The playful pair took a break from printing their dazzlingly detailed letterpress pieces to tour us around their shop. Olé! THE PRESSES Just one, a beautiful Heidelberg Windmill lovingly named “La Pecosa” because it came to us fully splattered of ink after 54 years of service. 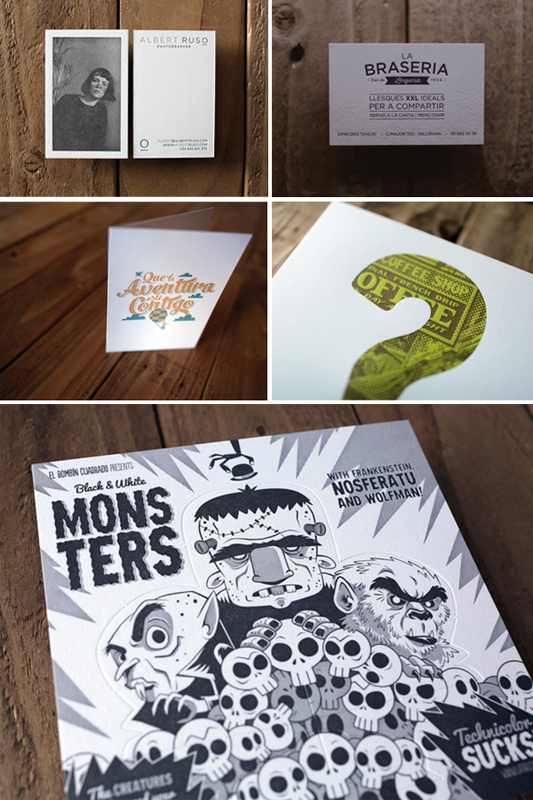 We are looking for a proof press to make the family bigger. SIZE OF PRINT SHOP We have a 322 sq ft workshop and 129 sq ft studio. TYPE OF SHOP Our workspace is located in a town near to Barcelona. We have restored two old storage rooms surrounding our house’s garden to set up “La Trastería”. THE LOCATION One of our favorite thing about the shop is that you can find a lot of things full of history in every corner. We found a lot of useful stuff while we arranged the workshop. FAVORITE THING ABOUT THE SHOP Choosing one could be difficult, but maybe the most atypical thing could be an old book called “Hints for the pressman”. The fact that we live far from the city keeps us creative and comfortable, we feel more comfy with a quiet life style. NUMBER OF PRINTERS IN SPACE As we are working in our own house, it is a private space. I am the printer (Mònica) but Germán helps me whenever I need him! MOST VALUABLE SHOP TOOL A flathead screwdriver, a depth ruler and an apron. FAVORITE INK We print with Martinez Ayala inks, they are made here in Spain. We have no favorite color, we love all of them, but it seems that a big range of turquoise is in its wave. SOLVENT OF CHOICE With just one press we have a tiny workshop, so clean up is not a big problem if you keep your workspace arranged after using it. Besides cleaning our Windmill is not hard to do. We use Varn’s Primula Wash. PLATE AND BASE OF CHOICE During the first year of La Trastería we have been using a 9×12 inch boxcar base with Jet plates. OIL OF CHOICE 30 weight non-detergent oil. Works awesome! WHAT TYPE OF RAGS DO YOU CLEAN UP YOUR PRESSES WITH We use recycled cotton rags. They work well and keep away dust and particles from our rollers. FLOORING MATERIAL A dark grey poreless tilling floor, it’s very easy to clean! FLOOR PLAN TIPS The main thing for us is to have all machines in a small perimeter, it helps us to clean faster. When the day is over, we just have to sweep and mop the floor. 10 minutes and ready! PIED TYPE We don’t have any type because we don’t use it. We would like have some big old wood type but it’s hard to find! ORGANIZATION ADVICE Keep it clean and clear. Clean and put back to their place every tool once it has been used. PRINTING ADVICE It’s not a secret, in the beginning, when we were learning, we wished to have an experienced person telling us: “Don’t be discouraged, come on, it’s just that the press you have must be perfectly adjusted”. If something doesn’t work, take a deep breath and look for the solution in the simplest things. Once everything is in place, the press will run perfectly. 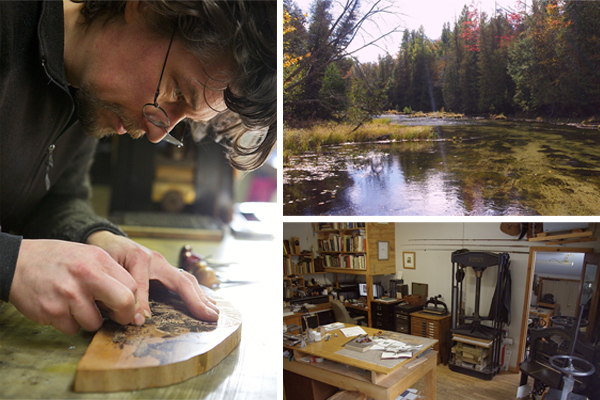 Huddled in between the breathtaking white pines of the Northern Michigan forest perches the letterpress and fine bookbindery of Deep Wood Press. 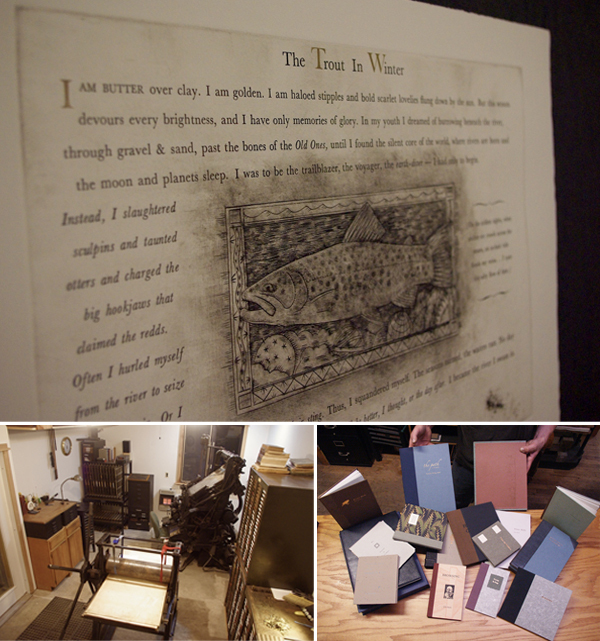 Chad Pastotnik, opens the door to his peaceful printing retreat to let us take a tour of this Antrim County gem. THE PRESSES Hmm, 9 presses. A 10×15 Windmill, 8×12 C&P OS, C&P Pilot OS, 3×5 & 5×8 Kelsey for platens. A Little Giant & Vandercook 219 OS for cylinder presses. A BAG 25.5×47″ intaglio press along with a 18×36″ Blick for my copper engravings. 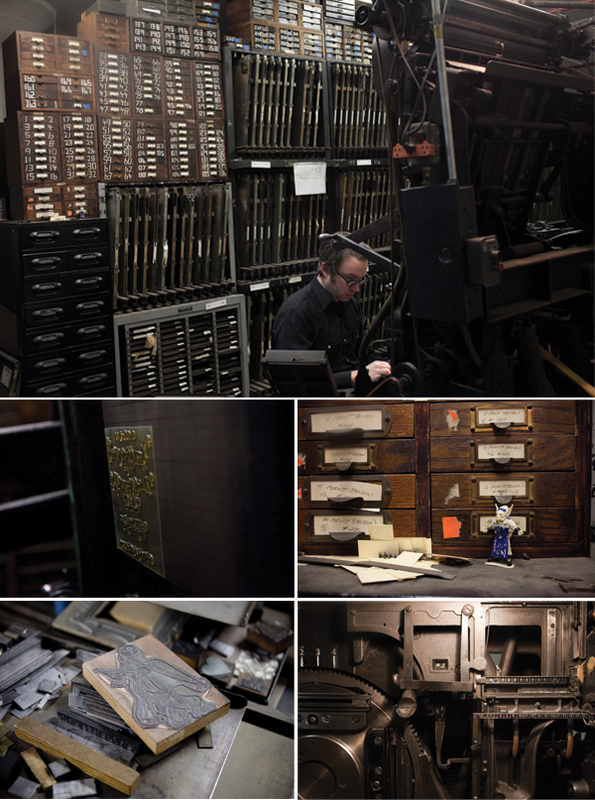 Also a standing press, book presses, lying press, foil press’s, 26″ guillotine and 150+ cases of type. 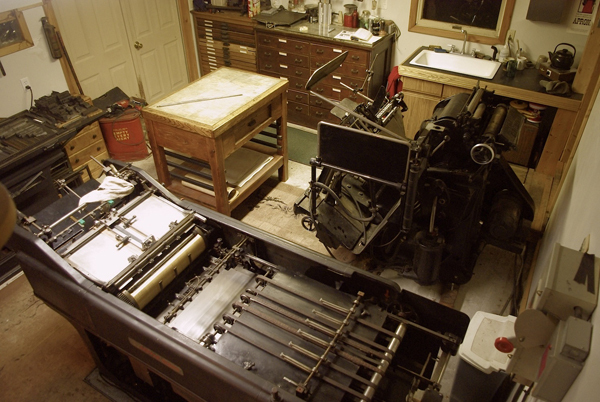 SIZE OF PRINT SHOP The bindery is 340 sq ft, pressroom is 360 sq ft and in another building I have a 220 sq ft partition that houses the intaglio presses along with my Linotype model 31 and a couple hundred matrice fonts in galleys. It’s all pretty tight. THE LOCATION The buildings are on the same property as my home in the middle of nowhere, nice to be accessible to the family. There’s a beautiful trout stream about 30 feet from the shop and plenty of others near by. I’m surrounded by about 450 acres of woodland and swamp protected by state land and Michigan Nature Association holdings. About 9 miles away there’s Short’s brewery, a meadery, a smokehouse and fine dining fun + Lake Michigan is a short drive away. Oh, and Detroit is 5 hours away, that’s a bonus. (N. MI humor). FAVORITE THING ABOUT THE SHOP Everything. Prized possessions – too many to list but probably my books about books and printing collection.… or perhaps the sound system. It’s very homey, lots of light. Nature is right outside and that’s the root of my creativity. NUMBER OF PRINTERS IN SPACE One, though it is a private space. I do take one apprentice a year for an 8 month stretch from fall-spring. MOST VALUABLE TOOL A plate gauge is a must for good press work if you want to get experimental with repeatable results. FAVORITE INK Oil base for most everything, current favorites are Graphic Chemical and Ink Albion Matte Black or Litho Roll Up Black. Raw Umber is a very versatile accent color in various opacities. I make my intaglio inks myself or use Graphic Chemical’s. SOLVENT OF CHOICE Kerosene is pretty much the standard here, too many different presses to streamline a universal system. I have an oily waste can for used rags and a pair of rubber faced work gloves for the clean up process. PLATE AND BASE SYSTEM OF CHOICE I’ve had a 9×12″ Boxcar base for about 5 years along with another 9×12 I had made at a local machine shop. I order KF95 plates but rarely use polymer for much. If it’s a repeat job it’s done in copper by Owosso and I have various base systems for 11 pt., 16 gauge and ¼” dies. OIL OF CHOICE 30 weight non-detergent motor oil does most all of it for the presses, scotch for me. WHAT TYPE OF RAGS DO YOU CLEAN UP WITH Anything that’s mostly cotton works just fine. There are usually 3 grades of rags in the shop: mostly filthy, moderate and mostly clean. FLOORING MATERIAL Maple hardwood in the bindery but concrete floors in the pressroom and Lino annex with work mats around the machines. FLOOR PLAN TIPS Have a large central island for a work surface (imposing stone for pressroom, table in bindery & and the intaglio bed does it in the Lino room) and the equipment and other counter space around the perimeter – less walking more working. Oh, and don’t do what I’ve done – decide early on you’re going to need a ton of space and keep it all in one building. PIED TYPE Some, but that’s what apprentices are for. ORGANIZATION ADVICE Keep it clean! You can’t work on surfaces covered with crap. Put things away when you’re done with them and put them in the right place. PRINTING ADVICE Tough one as I’m self taught with letterpress so all I knew is what I brought with me from my experience in printmaking and bookbinding – not much! Order every paper sample book you can, try all kinds of ink and from different manufacturers, visit special collections libraries and view printing as it has been done these past 500 years and read about the history of your craft. Oh, and if you’re still in school take some business or marketing classes! Davin Kuntze of Woodside Press let us in to his Brooklyn Navy Yard shop, which is nestled safely between artisans shops and within World War I enemy fire resistant walls. More now a refuge for the creative thought than for protecting, Davin muses on the need for more letterpress in the world and bad typography (a crime against humanity) as he shows us through the space. THE PRESSES In general use we have seven presses. There is the C&P treadle press that came from the American Typefounders Company; two C&P Craftsman presses (one for printing and one for scoring and perfing); a Windmill for longer jobs; a Heidlberg KSB; and finally two Vandercooks, a Universal III for poster work, when we get it, and an SP20 that we use almost exclusively for proofing type. In addition to that we have a number of random presses in various states of repair, mostly small format platen presses that no one seems to want these days. THE LOCATION We’re located in the Brooklyn Navy Yard, which is home to its own strange assemblage of artists, craftsmen, furniture makers, malcontents, mad scientists, old school Brooklyn hangers-on, young upstart urban farmers … the usual crowd that is attracted to affordable industrial space. We are in a high-floor corner of a massive 11-story building that was built for World War I, and actually carries a fire-rating of “able to withstand enemy attack,” although the enemy envisioned is most likely the Red Baron. Lomography has a distribution facility across the hall from us, and the Yard also has the largest manufacturer of military-grade body armor in the country. FAVORITE THING ABOUT THE SHOP The view is one of a kind. We look out over the East River onto Manhattan from the southern tip of the island, up past the Williamsburg Bridge, to the United Nations. A lot of the time it feels miles away from the frantic pace of the city. That and the radio, be it NPR or some music at a volume that will drown out the phone if it starts to ring. NUMBER OF PRINTERS IN SPACE It’s just us at the moment. We have a working relationship with a few other artists who occasionally come in to do collaborative projects. 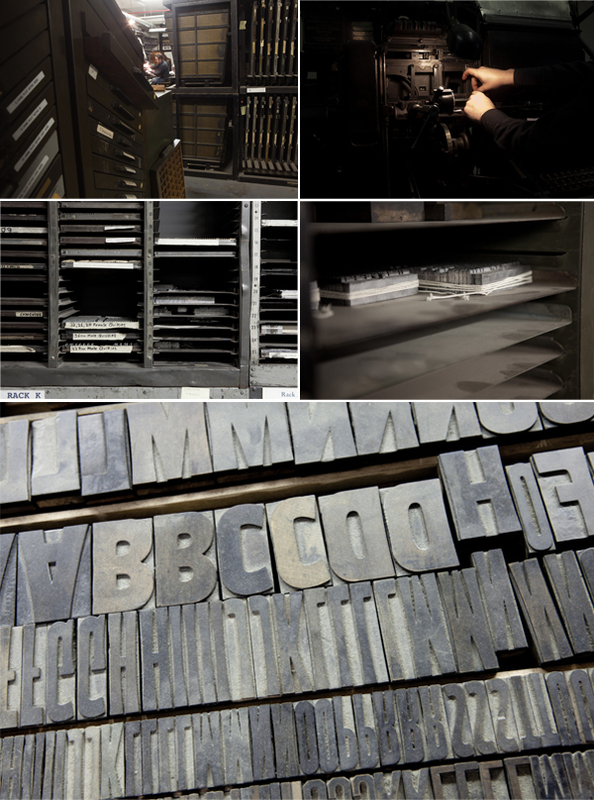 And we’re always happy to give a tour complete with our own (possibly skewed) history of printing and typecasting. MOST VALUABLE SHOP TOOL I can’t think of any one machine we’d really suffer without, but the Linotype comes in really handy for book projects. There are a number of chapbooks we’ve done over the years that would easily have taken three or four times as long without this incredibly frightening contraption. FAVORITE INK We use Van Son rubber-based for the most part. My favorite colors tend to be very rich. Far too many designers waste countless hours deliberating between four slightly different shades of light brown which all look like, well, baby crap. Type should be black (for the most part) and you should pick an accent color that makes a statement. SOLVENT OF CHOICE We use Power Klene VC for the presses and Blanket Wash #4 for type, both from Prisco. BASE AND PLATE OF CHOICE We’ve used KF152 for a number of years. 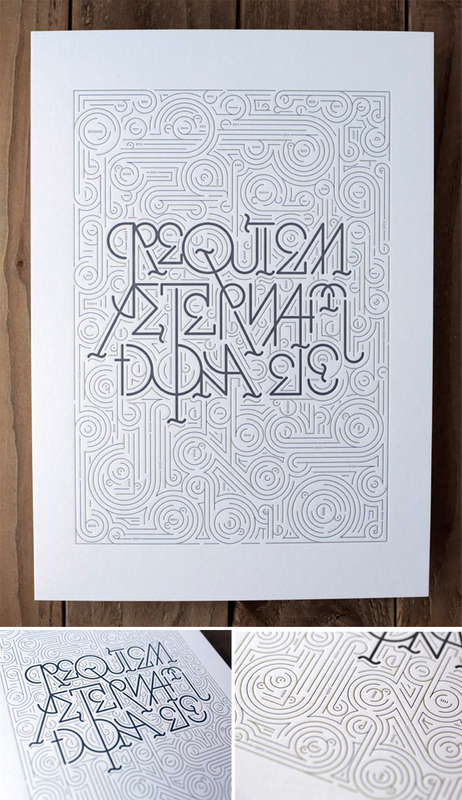 People want “letterpress quality,” which means we have to smack the paper too hard. OIL OF CHOICE You got me. We have a giant barrel of some sort of oil that I’ve been using for years, seems to be 30-weight motor oil. WHAT TYPE OF RAG DO YOU CLEAN UP YOUR PRESSES WITH We get our rags from an industrial rag supplier. Every month or so they show up with a barrel of clean rags and take away our dirty ones. Not very exciting. FLOORING MATERIAL Concrete. This is the Navy Yard and our building was built to warehouse aircraft-carrier components. It can stand up to a few tons of printing equipment. FLOOR PLAN TIPS Smaller is actually better. It keeps things simple and all your tools are close at hand. A place for everything and everything in its place. Unfortunately we don’t follow our own advice. This place is a constant battle against entropy, and I love it. But losing all six pairs of scissors for a month at a time can be frustrating. PIED TYPE We have a couple barrels of it. An associate of the press who cuts mats and makes brand new foundry type occasionally takes a big bucket away to cast a new face. In exchange we sometimes get brand new type for the shop. Works out for both of us. PRINTING ADVICE When I first got into printing, I was given a book by DB Updike called “In The Day’s Work” which I recommend to anyone in any creative field, although this book is more for the practical printer. Basically it says take pride in your work, keep your shop clean and organized, and don’t let your clients make decisions because you, as the printer, are the expert. I should have read that more closely and taken it to heart. I think the three books I’d recommend for a printer starting out are “In The Day’s Work” for self discipline and self confidence; “The Elements of Typographic Style” by Robert Bringhurst, because bad typography is a crime against humanity; and “The Elements of Color” by Johannes Itten, because there IS a science to why some colors work together and others don’t.